Ystad  is a small but charming city in Scania, or Skåne, part of southern Sweden. It is situated on the south coast of Scania with good beaches west and east of the town, and as a harbour is a meeting place of ship, train and bus connections. It has a new marina and makes a great base for exploring the area, as well as Skåne. The area was first settled in the 12th century, and the town has an attractive medieval centre, and its coastal position, facing Germany across the Baltic, means that it was closely associated with the Hanseatic League, which it joined in the 14th century. It has a medieval church and many half-timbered houses and pleasant pedestrian streets. Ystad hosts a number of festivals and has a decent art museum, plus a number of other museums and attractions. It is known internationally as the setting for many of the novels of Henning Mankell, featuring fictional Ystad police inspector Kurt Wallander. 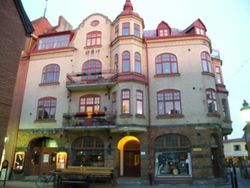 There are regular Wallander tours in several languages, and even free showings of films in the main square (Stortorget). Malmö (Sturup) airport (IATA MMX) is 30 minutes drive away. Copenhagen (Kastrup) airport (IATA CPH) is 1 hours drive. Local train ("pågatåg") from Malmö, Skånetrafiken . Direct train (IC Bornholm) from Copenhagen, DSB . With connections through to Koln and Brussel. Polferries  and Unity Line  from Świnoujście, Poland. Walk. Everything is easily accessible on foot. There's also a little tourist street 'train'. Biografteatern Scala. St. Östergatan 12. Sweden's oldest cinema, now restored. Karl XII's Hus, Stora Västergaten, where the king is said to have spent the night. S:ta Maria church (13th century) is the oldest surviving building in Ystad and one of Skånes oldest brick churches. From 9.15pm until 3.00am the night-watchman blows his horn to reassure the townsfolk that all is well. Ystads Konstmuseum, St Knuts Torg, open Tue. - Sun. - a good art museum, with interesting exhibitions and a decent shop. Ystad Film Studio. Ystad is a centre of the Swedish film industry; the studios were established at the closure of the old military barracks and there are guided tours available, plus the Cineteket, an interactive film museum. Walk through the old part of the city and enjoy the old half-timbered houses. In the evening eat and drink on the main square or shopping streets, and enjoy the comings and goings of the volunteer fire brigade in their antique vehicles. Follow the Wallander trails - if you are a fan of the books or films there are many, many references as Mankell based his material on actual places and situations. If this is to be believed there seems to have been a murder or gruesome incident on almost every corner of the town. In reality the police are hardly ever seen, except when parking up to collect a burger order from the stall on St Knuts Torg, near to the excellent Tourist Information office within the Art Museum. During summer, enjoy a walk by the beach (east of the town). Stop by and grab a beer or ice cream at "Fritidsbaren" and get a good view of the ocean. North of the town is a beautiful lake and forest area. Several national parks are found within a short drive. Every other year, Ystad hosts a Tattoo, a must-see if you are interested in music. See the website  for more information. Ystad is the perfect base for exploring south Skane; there's a wealth of places to visit, something for everyone, and the Tourist Information in town is very helpful. Bryggeriet on Langattan 20, doubles as a brewery. Great food and you can sit in a characterful courtyard or inside dominated by giant shiny copper stills. Several good eateries in town, including Japanese, Chinese and Thai. Havsnära Fiskrökeri. Easy to overlook but a small smokery with excellent bargain dishes to take away or eat sitting outside. Great fish and chips, and friendly service. Head for the marina, pass the two restaurants and it's tucked away between the car park and the dunes. This page was last edited on 21 June 2015, at 18:17.